For me, today is a glorious day. It is the day I woke up five years ago, Parkinson’s gone, life back in balance…cured. “I am cured of PD…no symptoms, no nothing. Here are some things for you. 2. I have met in person over 500 people at workshops and conferences. I would imagine that if I exhibited a single symptom, somebody would have said something by now. 3. Click here for my most recent workshop. If you read the comments, you will see that Debbie, Bailey, and Rick all attended the workshop. In fact, Bailey and Rick attended my 2012 Seattle workshop, too, this being the second time they attended a workshop with me. Just so you know, the workshops are 7 hours and I am in front of the group the entire time, talking, eating lunch together, doing the physical part of the Recipe together, and meditating together. 4. I have had people come to Tampa to meet me. They have come from as far away as Holland, Western Canada, and Amsterdam. Click here for the post about the woman Margriet from Amsterdam. She posted a comment, and it would be worthwhile reading, too. For those of you still struggling with faith, I am hopeful that this information inspires you in knowing you can be cured, too! I awoke on the morning of June 12, 2010 and popped out of bed fully awake, fully aware that I was cured of Parkinson’s, I dropped to my hands and knees and cried praise and gratitude. And through my tears of gratitude, I promised God that I would help people with Parkinson’s for the rest of my life. So, my friends, as I write today at the end of a couple of weeks of congratulatory calls, Skypes, and FaceTimes, I am expressing my gratitude to all of you. By you being here with me, opening your hearts to the message, listening, reading, commenting on the blog, and working so hard to cure yourselves from Parkinson’s, you are helping me fulfill my promise to God. For that, I am abundantly grateful to all of you. Thank you. June 12, 2010 was a bit of surreal day. Sally and I knew it was real but we held off telling anybody until we had a little time that day to sit with it. Sally’s mother came over for a visit that day and we decided to not say anything because we were still grasping the full recovery ourselves. Well Mother, apparently you had some idea. So, to my mother-in-law, Nancy Ward, one of the small group of people who believed in me throughout my journey to my cure: Mother, you have no idea how much it meant to me, and still means to me, that you never gave up on me and never doubted I would be cured. Thank you. I love you. To my children, Steven, Genevieve, and Victoria, you make us proud everyday. Couldn’t have done it without your love and support in helping me around the house and not giving up on your dad. Thank you. I love you. And, Sally, the love of my life…what a journey it has been. Thank you for holding me and never letting go. I love you! Yes, today I am five years cured of Parkinson’s. You can do this too! Thank-you, Howard! so uplifting, encouraging…. What a glorious day that was!!!! Thank you for sharing your story with the world !!! Congratulations and have a wonderful weekend. Thank you for all the help and the friendship you give to me. I never tire of hearing your story and the additional details you so generously share. I am grateful to be a benefactor of your promise to God. Because of your inspiration, I face my earthly future without futility. Celebrating five years recovered with you! Hi Howard, may we all get to have a 12th of June Day, and we will. I am one of your biggest fans because you give so much of you to so many unconditionally and that to me, is why I always say you are ” God in motion”. I am sure you and Sally and the kids never tire of the joy of this anniversary! Thank you all for your well wishes. I am having a wonderful day. In answer to Sylvia, I got tremors in September 2009, and by the time I got in to see the neurologist and was diagnosed, it was in the beginning of November 2009, and here were my symptoms: Internal tremors; Extremely poor balance; Bradykinesia (walking — hunched forward, shuffled feet, arms did not swing); Rigidity (arms, legs and upper back were tight and extremely painful); Constipation; Inability to stand up straight; Inability to get out of a chair without using arms; Inability to go up and down stairs without holding railing and using arms to pull self up; Inability to get a utensil to my mouth when trying to eat; Falling asleep in middle of the day sitting at the computer; Frozen face; Inability to write; Inability to type with two hands; Constantly worn out and tired. 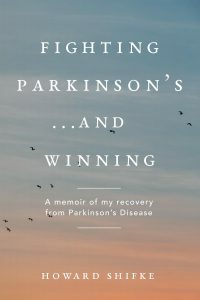 One month before my final recovery, this is what my rigidity looked like: http://www.fightingparkinsonsdrugfree.com/2010/05/10/fighting-parkinson%E2%80%99s-having-a-positive-attitude/. However, Sylvia, I was focused on recovery and was not focused on symptoms. I accepted the symptoms and lived my life, which is why I did not write about them much. You are not your symptoms. You are a beautiful human being who happens to have Parkinson’s for now, but not forever. Wishing everybody a wonderful weekend! Howard maravillosa tu historia de recuperacion……. usted toco mi corazon y me conmovio hasta las lagrimas…..es una motivacion muy grande en nuestra condicion para seguir adelante y lograr nuestra curacion…….yo deseo con toda mi alma que muchos de nosotros tambien estemos contando algun dia nuestras propias historias de recuperacion. tengo 2 preguntas para usted. tenia temblor como parte de sus sintomas? cuanto tiempo paso entre sus primeros sintomas y su diagnostico? Howard wonderful ……. your recovery story you touched my heart and moved me to tears ….. it is a big motivation for our condition to move forward and achieve our healing ……. I wish with all my heart that many of us also we are telling our own stories someday recovery. tremor had as part of you symptoms? As time passed between the first symptoms and diagnosis? Jimmy, Thank you for your beautiful words. Yes, I had an internal tremor and shook all the time on the inside. The only relief I got from it was Governing Vessel Acupressure that Sally did for me each night. In looking back, I had some “notifications” that I was having physical issues about three years. When I was telling my neurologist that in February of 2009 I could not squeeze the pump at the gas station and lacked the strength to pick up the pitcher of water, which also gave me a huge pain in my arm, he said that those were my earliest diagnosable symptoms. I received the diagnosis in November of 2009. I write this through tears. Every day when I wake up feeling just a bit better than the day before, I know it is because of you. How incredibly inspirational you are! Not only did you cure yourself, you opened your heart to so many other people to allow and encourage them to cure themselves. Your exquisite promise is helping to heal so many others. Know you are loved and supported by so many people in this world. Your sheer goodness and your high aspirations are radiant. We all celebrate you today! Sending you immense gratitude and love! Ditto what Susana said! I couldn’t have said it better. Howard, you are my hero! Interesting that I was diagnosed the same day you had your full recovery. Thank you for paving the way for all of us, destroying the fear and guiding us to finding a new life in balance, and most important, our true selves. My gosh Howard, how wonderful that we have you to guide us. I too was moved to tears when you expressed how you felt and acted on the day of your recovery!! We are so blessed to have you. Thank you with all my healing heart, healing soul and my healing Parkinson’s body!! For those of you who have not yet met Howard, rest assured – the man is cured and is the real deal! Howard is not only the poster boy for a healed PD’er, but a prime example of a healthy, happy human being. I can say this because I have attended two workshops where I saw him maintain high energy throughout the day, and also because I have had the pleasure of hanging out with him outside of workshops. Big High Five to you on your Five year anniversary Howard! It was so great to meet you at the workshop. I have been thinking about you and wondering how you are doing. I hope you are well. Thanks for sharing your heart felt comments. Have an amazing day! I would just like to second what Bailey had to say. For any of you who have not had the opportunity to meet and rub shoulder with Howard, he is indeed the real deal. Not only is he Parkinson’s free…he is healthy, honest, giving, energetic, caring, and has a keen desire to help anyone who is willing to listen, to become Parkinson’s free also ! He is very devoted to sharing what he knows and has learned with the world. I feel very blessed to have not only spent time with him during the workshop, but also to have had him “hang out” with my husband and me during the weekend in Seattle. Thanks Howard for all you do to help me and for your friendship! It is magnificent to envision the day of my recovery! It is my hope that all of us will be able to cross the finish line and join the ranks of the Parkinson’s Free. Thanks for all of your help and inspiration Howard! I too am very happy to have attended one of your workshops here in Santa Fe and meet you in person! It is great that you are 5 years parkinson’s free! Reading your account of that wonderful day it sounds like resurrection morning!!! Amazing how it happens. You chip away at the iceberg, not seeing much change, but holding onto hope and faith. Then suddenly you realize you’re free! All things are new! O happy Day!!! Thanks to your promise to God we all benefit. God bless you, Howard!!! !